Mousey's MikexSandy, PauloxLucy, AugustusxDaisy Supanova commission! Man I love this picture! I just love this picture! It is BCB 20 years later! Which is pure awesomeness! Also I don't care if Mike picks Lucy or sandy Mikexwhoever makes him happy. Anyway great pic Taeshi I love these paint pics. 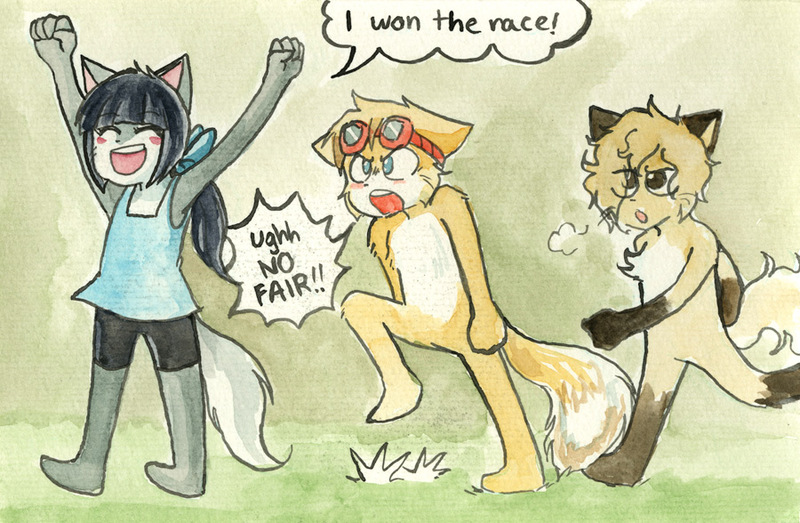 Aaahh this is pretty great Taeshi, they are all little perfect bbbyysss! Even your "quicker" watercolors are lovely. I used to have hair just like the last kid! ... But then I got it cut! ... I loved my hair! Like the MikeXSandy child. So adorable. What a creative commish! I totally lol'd at this when i first saw it. Whatever happened to the MikexDaisy child? Aw man I'm so tempted to draw these guys now. Hmmm I just thought of this. I wonder what a McCainxSue child would look like. Most series don't end the way I want them to finish. If these couples got together and this was their offspring, I would finally feel like I've seen a perfect ending. Also I would include Abraham on a telephone pole glaring a Augustus and Daisy for fun in the last chapter. And the Mike/Lucy rivalry lives on. AugustusxDaisy= Win, except for the fact that Final Fantasy Cat is creepy, still cool. Last, definitely not least, PauloxLucy= Makes me happy, and their kid is pretty nice looking! Ohh man it s a great draw!!! I bet Sandy and Mike's daughter is perfect at everything! Suitable for next generation casts, really.. I SHIP ALL OF THIS YES MORE PLS.